With regard to myself I will say that in my early youth, while reading the Bible–the record of Judah, and the New Testament–I read of Jesus Christ, of His Apostles, their works, and the dealings of God with them, and of the doctrines which they received and taught to those around them, There was something glorious in those principles which the Savior of the world and His disciples taught in their day. I had a great desire in my boyhood and youth that I might live to behold a people who were inspired of the Almighty, and who had power and authority to go forth and teach those principles which I read of within the lids of the Bible. At that time I could not hear them taught. They were not taught by any person within my knowledge. But, as I have said, I had a longing desire that I might live to behold a people on the earth who would teach these principles to me. I spent many a midnight hour in my mill, and among the rocks, in the forests and in the fields, in pouring out my soul to God and praying that I might live to behold a people on the earth who would teach these principles. In answer to my prayers, the God of heaven promised me that I should live to find such a people. He promised me that I should have a name and a place within the House of God and among His people–a name that should not be cut off. I am strongly impressed today, in reflecting upon our history and the history of myself, and the position which I occupy, with the promises of God to me in those early days. They have been fulfilled; and this day has crowned the pinnacle of the responsibility which is placed upon my head. I marvel when I contemplate these things, which are in fulfillment of the promises of God unto me. And when I say this of myself, I speak of hundreds of the Elders of Israel who have been moved upon in the same manner that I have been. Those with whom I stood connected in the early period of the Church–the Prophet Joseph Smith, Hyrum Smith, and those men that laid the foundation of this Church and kingdom, together with other Prophets and Patriarchs–have passed away. They are on the other side of the veil. I still have the privilege of remaining, and I this day have been called to this responsibility in the midst of my brethren–a responsibility that no man can fill unless he is inspired of God. But I will say this to my brethren and sisters, in the name of Israel’s God: The Almighty will never permit me, nor any other President who holds the keys of the Kingdom of God, to lead you astray. If I do not walk in the paths of righteousness and do what is right in the position that I occupy, He will remove me out of my place, or any other man who attempts to lead the people astray. The position which I occupy, and that occupied by my brethren the Apostles, should not have a tendency, if we have the Spirit of God, to make us lifted up or exalted in our spirits before the Lord. I know, as the God of Israel lives, that I have no power, nor have I had, in this Church, to perform any work pertaining to this Kingdom until it has been given unto me by the God of heaven. I know Joseph Smith had not, nor Brigham Young, nor John Taylor, nor any Apostle or Elder in this Church and Kingdom. And the moment that I attempt to become lifted up in the pride of my heart, because of any position that I hold, that moment I become a very unwise man. So with anyone else. The higher our position the more our responsibility. During the little time I may spend here in the flesh, I stand in need of the prayers of the Latter-day Saints, of those who have faith in God. So do my brethren that surround me. So do all the authorities of the Church. We all stand in need of the Holy Ghost and the power of God. Without this we are not qualified to fill the positions which we are called to occupy. I feel as though I want to bear my testimony to the truth of this good old book, the Bible, for a few minutes–the book that all the Christian world profess to believe in. There is an effort made today by the infidel and unbelieving world to ridi-cule the Bible, as not being the word of the Lord. I will refer to a few things that have been manifested in fulfillment of the record. To commence with, I will touch upon the first dealings of God with man. The first son that was begotten by Father Adam, whose name was Cain, proved to be a murderer. He slew his brother Abel, who held the Priesthood, and the Lord pronounced a curse upon him. He showed Cain the position he was in, and told him what the result of his crime would be; and Cain said unto the Lord: My punishment is greater than I can bear. Read the history of ancient nations and the dealings of God with them, as contained in the Bible and other historical works. When those ancient kingdoms and peoples became wicked and corrupt, when they turned away from all that was virtuous and holy, the Lord raised up prophets to warn them; and these prophets, though perhaps unpopular in the eyes of those with whom they dwelt, warned these nations and cities of the judgments that would overtake them. What followed the warnings of these prophets? Read of the fall of the mighty cities of Thebes, Nineveh, Memphis, Tyre and Sidon, Babylon the Great, and Jerusalem itself. All these great and mighty cities and nations were warned by the servants of God of the judgments that would overtake them. Did the inhabitants of those cities believe the words of the prophets? They did not. But did those words come to pass? They did; and those cities were laid waste and their inhabitants destroyed. Thus the words of the prophets and in-spired men were fulfilled to the very letter, not one jot or tittle failing unfulfilled. And yet the infidel says there is no God. These same prophets and patriarchs also saw, by vision and revelation, our day; they pointed out the generation in which we live, and they all declared that, in the latter days, the God of heaven would set His hand to gather together His people and establish His kingdom. The Revelator St. John also declared what should come to pass in the latter days. In the 14th chapter of Revelation he says: And I looked, and lo, a Lamb stood on the mount Zion, and with Him an hundred forty and four thousand, having His Father’s name written in their foreheads. In fulfillment of the declaration of St. John, the angel of God has flown through the midst of heaven. He has delivered the Gospel of Jesus Christ to the inhabitants of the earth, and revealed unto them the word of the Lord. The Holy Priesthood has also been restored. This Gospel was to be preached “to every nation, and kindred, and tongue, and people.” It has now been preached almost sixty years–from the organization of the Church until today; and in fulfillment of the revelations of these inspired Prophets and Apostles, a multitude of people are today gathered together in these valleys of the mountains. In fulfillment of those revelations I stand today in this Tabernacle, which the prophet saw was to be built upon the tops of the mountains, as a covering from the heat and the storm. In this Tabernacle today, also, are ten thousand Latter-day Saints, which is a witness to Jew and Gentile of the fulfillment of the promises of God. Yet the infidel says, “Behold, there is no God.” The man who says there is no God is a fool. We are here in fulfillment of prophesy and revelation. We have received the Gospel of Christ. The Kingdom of God has been organized. It is rolling on; and it will continue to roll on until this scene is wound up. Now, I want to give a little exhortation to my brethren. 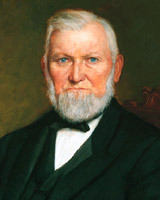 Brother George Q. Cannon touched upon a very important principle this forenoon–a principle which has often rested upon my mind; that is, with regard to the spirits that surround us. He said that one-third of the hosts of heaven were cast out because of their rebellion. I suppose we may say that at least one hundred thousand millions were cast down from heaven to earth. Where are they? Some are in Salt Lake, some in New York, some in Amster-dam, some in Constantinople, some in Jerusalem; in fact, they are in every city and hamlet wherein the inhabitants of the earth dwell, and especially where there are any Latter-day Saints. And whether there are one hundred or not to every man, woman and child, there are enough of them, at least, to labor for our overthrow. I say to my Counselors, to the Apostles, to the Seventies, the High Priests, the Bishops, and all men who bear the Holy Priesthood, do you suppose these devils are around us without trying to do something? Are they asleep? Have they not a work to perform? I say to my brethren who bear the Priesthood, we have got a mighty warfare to wage with these spirits. We cannot escape it. What will they do to you? They will try to make us do anything and everything that is not right. These devils would be very glad to make me and my brethren think we are great men, smarter than anyone else; to divide us one against the other, and to cause us to seek to confess our brother’s sins instead of our own. We should therefore watch ourselves well. I should do this; my Councilors and the Apostles should; we all should. And unless we are united together, as has been said before, we are not the Lord’s. But today we have certainly manifested a union here that the world is not acquainted with. We have, however, a mighty responsibility resting upon us. The eyes of all the heavenly hosts are upon us. The eyes of Father Adam, and the patriarchs and prophets, both ancient and modern, who have gone to the other side of the veil, are over us. And if our eyes are opened to comprehend the things of God, we can comprehend our responsibilities; we can comprehend the powers of the Holy Priesthood and the relationship which we sustain to God. We certainly should humble ourselves before the Lord. We should labor with all our might to build up the Kingdom of God in what little time we have to spend here in the flesh. Our aim is high. We aim at eternal life; we aim at immortal glory; we aim at a place in the celestial Kingdom of our God, with God and Christ and those who have kept the celestial law. In order to get there, we have got to keep the same law that has exalted those who have gone before us. This is not our home. We were kept in the spirit world until this generation, and have been brought forth, through the loins of Joseph and Ephraim, to stand in the flesh and to bear off the Kingdom, to hold the Holy Priesthood, to do the works of righteousness, to build temples, to redeem our dead, and to attend to those ordinances which the God of heaven has declared we shall perform. This is our work. We have a long eternity before us. But all of us will have to meet at the bar of God–the righteous and the wicked, those who are living and those who are dead. I wish to say with regard to the rising generation–the sons and daughters of the Latter-day Saints–that they should take the counsel of their fathers; they should honor their parents, and honor God, and receive such counsel as is given unto them by wise men. I think many times that our children do not comprehend the position they occupy. They do not comprehend what lies before them. Their fathers are passing away. Yet this Kingdom has got to remain on the earth until the coming of the Son of Man. This work has got to follow their fathers; it has got to rest upon the sons and daughters of Zion. I have a great desire that the institutions which have been organized in Zion for their welfare may be blessed; that our sons and daughters may attend the Primaries, the Sabbath Schools and Mutual Improvement Associations, and unite together in these societies, that they may receive the benefit of the same.